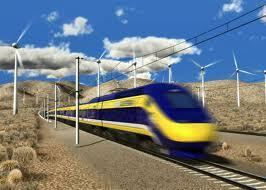 So in 2008 the voters of the State of California voted and approved the creation of a High Speed Rail Line. I was excited. I really thought that’s what America needs and that California could show the rest of our great nation how we get things done here in California. Silly me. It’s 4 years later and we still have no train. It seems like we are once again mired down in government… well to be honest we seem to be mired down in mire. There’s still no agreement on how they will bring the train into Los Angeles! According to this report the staff thinks that the high speed rail should go through Palmdale instead of up and over the grapevine. Here is what they say…“The engineering team conducted several months of analysis that included extensive modeling to develop, identify and analyze alignments along the I-5/Grapevine corridor. The environmental review included an analysis of impacts on cultural and biological resources, wetlands and water bodies, growth- inducing impacts, national forests, farmland, and opportunities for using alignment variations to avoid impacting sensitive resources. The Study also analyzed constructability and cost issues and an evaluation of operational aspects, including ridership, operating costs and maintenance costs that were not compared qualitatively in the 2005 Program EIR/EIS. “So back in 2005 no one took into account that the I5 goes though the grapevine which are tall mountains? Oh right putting a man on the moon 40 years ago was possible but putting train tracks up the side of a mountain is too tough!But wait they want to use Pamdale and the Antelope Valley instead of the grapevine. While I don’t really have a strong opinion about what route that they should use I do have to ask. Isn’t the Antelope Valley out of the way? 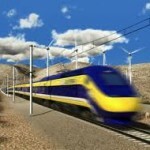 Won’t it take longer for the HIGH SPEED RAIL LINE to travel? Oh silly me. When you get to the bottom of the report they say this:“The Study included intensive outreach to local agencies, cities, and communities to determine the local community impacts of these possible alignments. The Antelope Valley alignments continue to have strong stakeholder support based on the comprehensive outreach done during the Study process.”So what does strong stakeholder support mean? They don’t define what this is and why it’s important. The press release mentions that the Antelope Valley alignments… What alingments? What impacts are they talking about? Why is everything so cryptic? Why can’t governement speak clearly? Common seems to be lost, turf wars are hinted and more studies are on the table. In a recent press release found here they say“We’re very interested in enhancing connections between high-speed rail and local transit and other transportation systems. The Governor has told us he wants a plan that will get high-speed rail trains on the track sooner and in a less costly manner than previous plans called for. If that can be accomplished by electrifying Caltrain’s lines and using that right-of-way, then it’s certainly something we want to consider,’ Richard said.I commend the Governor for giving the directive of blending the lines but I have to ask, why isn’t this a no brainer? Why does it take the Governor to provide this incredible wisdom? Why wasn’t the idea of using the high speed rail lines and local transit thought of back in 2008? “The agency overseeing California’s high-speed rail project reportedly plans to reduce the projected cost of the bullet train by $30 billion by connecting it with existing rail lines on the outskirts of Los Angeles and the Bay Area. Does anyone else feel lied to and abused? I know I sure do. How has it gone from 9 billion to 43 billion? Plus now instead of a no connecting ride they are going to force the riders to make connections which will be yet another reason why people don’t want to take what’s looking more and more as a silly train. High-speed rail means tens of thousands of good, family-supporting jobs for California — jobs not just to build the trains and the train line, but also jobs to operate and maintain it. And there’s more — hundreds more jobs will be created for suppliers, restaurants and other businesses along the route. Because the electric power to the trains can be produced by sustainable and renewable power sources like wind and solar, this system will cut air pollution and smog throughout California. We also found a mention of a report written by Sarah Schlicter that lists top reasons for train travel. I encourage you to read the whole article. I only skimmed the top of each argument in order to entice you to read the whole thing! 3 . Flexibility: Except on long-haul or infrequently traveled routes, trains tend to offer travelers a great deal of flexibility. 6 . Door-to-door convenience: Unlike airports, most major train stations are located right downtown in the heart of the cities they serve. 7 . Eco-friendliness: Trains are more energy-efficient per passenger mile than planes or cars, making them one of the most eco-friendly transportation options around (short of walking or riding your bike)! 8 . Comfort and relaxation: Rather than cramming yourself into an ever-shrinking airplane seat or squinting at road signs trying to figure out where to make your next turn, why not relax on a train? 10 . Beyond just transportation: Unlike airplanes, which whisk you from point A to point B with barely a glimpse of what’s in between, a train ride can be a destination in and of itself. I still think the train is a good idea. I just think that it’s gotten out of hand it that it belongs in the hands of private business and not as a public entity. Our government sure doesn’t know how to do it. What do you think? We’ll be talking more about this whole issue. We’d love to have you weigh in on it!